This film is #1 on the Best of 1997 list. "Titanic"
In a year that has seen the significant failure of several huge-budget movies, "Titanic" stands as a monument to the art of epic filmmaking. Like a gorgeous, one-of-a-kind gown by a master couturier, it is opulent, daring, detailed, vastly over-priced and incomparable to anything produced by the generic factories that crank out the industry's standard wares. "Titanic" is a film that realizes its special effects are the draw, yet overshadows them with a love story so engrossing it carries the whole movie. By the half-way point, the fact that this ship is doomed has been temporarily forgotten. When the notorious iceberg does take its bow (pardon the pun) and the action and effects kick in, they are spectacular -- unequaled, in fact -- but the character-driven elements of the story hold their ground with compelling, emotional results. Bookended by a present-day story of salvage scavengers searching the Titanic's wreckage for a priceless diamond necklace (the movie's only cheap effect -- it looks plastic), "Titanic" begins with breathtaking underwater footage inside the actual wreck, which serves as a eerie visual framework for later scenes that take place aboard the ocean liner. The story goes back in time when the divers uncover a charcoal sketch of a young woman wearing the diamond, dated April 14, 1912, the night the ship sank. As luck would have it, the woman is still alive (age 101), and the fortune hunters fly her out to their ship in the hopes of discovering the fate of the jewel. Her vivid recollection -- "I can still smell the fresh paint," she says. "The china had never been used. The sheets had never been slept in." -- brings the heart of the story to life. In the past she is played by Kate Winslet as a recently bankrupt heiress engaged to a pompous, priggish, old money socialite (Billy Zane) who has quashed her spirit. Looking for an out, she nearly commits suicide by jumping from the stern, but is saved by a charming drifter (Leonardo DiCaprio) traveling in steerage and she falls in love. The lovers share happy and sensual moments, and inevitably come up against unapproving parents and a vengeful fiance. But as you surely know, these are the least of their worries. This storyline may not sound very original in synopsis. But director James Cameron's script is layered in ways I would have never guessed were within his abilities as a writer. His fictionalized story is magnetic and his characters are richly developed and arrestingly acted. Winslet plays her sorrowful heiress as stuck in a manic conflict for freedom that tests her strength of will. DiCaprio, who can run hot and cold, sometimes in the same picture ("Romeo and Juliet"), is solid and constant as a free-spirited artist quite comfortable with his ill-fitting place in the world. As they stare at each other like new lovers do, with joyous, smoldering eyes through tousled hair and tender touches, they lend the movie a chemistry that carries through the spectacular tragedy that is to follow. 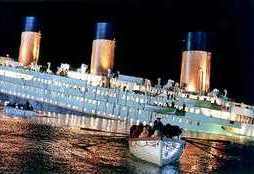 The death of the Titanic, for which Cameron built a 9/10 scale model of the ship that was actually submerged, is the some of the most groundbreaking effects work in the history of film. The seamless marriage of computer-generated effects with heart-stopping camera angles, stunts, and remarkably authentic sets couldn't be more realistic. When we first see a long shot of the bow of the ship tilted nearly underwater, it is positively panic-inducing. The adrenaline, the fear of the passengers is so thick and unrelenting it's almost suffocating. This is especially true of the climax, with the stern of the ship 90 degrees to the water and going stright down as people fall into the sea 200 feet below while DiCaprio and Winslet hang on white knuckled to the railing. Cameron does get a little carried away making his point, with random extras swept away by walls of water in dozens of shots, when six or seven shots would have sufficed. But he makes up for his exuberance with perfectly placed personal moments of torment, like a shot of an elderly couple desperately embraced in a bed as the water rises around them. There are small nagging problems (only one character even mentions the freezing temperature of the water) and one glaring loophole: The modern day salvagers never get their answer about the fate of the diamond (although the audience does). But these are insignificant quibbles in what is certainly the best film of 1997. "Titanic" is not a cookie-cutter disaster flick with a handful of under-written converging plots. This is a powerful, passionate and focused drama set against one of history's most incredible catastrophes. When "Titanic" was moved from its summer release date, I laughed at the studio for claiming the bump to December was to make the film a more serious Oscar contender. I still say that was pure spin, but I do expect deserved Academy Award nominations in the following categories: Picture, Director, Screenplay, Actress (Winslet), possibly Actor (DiCaprio), Supporting Actress (Kathy Bates steals every scene she's in as the neuvo riche Molly Brown), Cinematography, Score, Production Design, Visual Effects and Costumes.